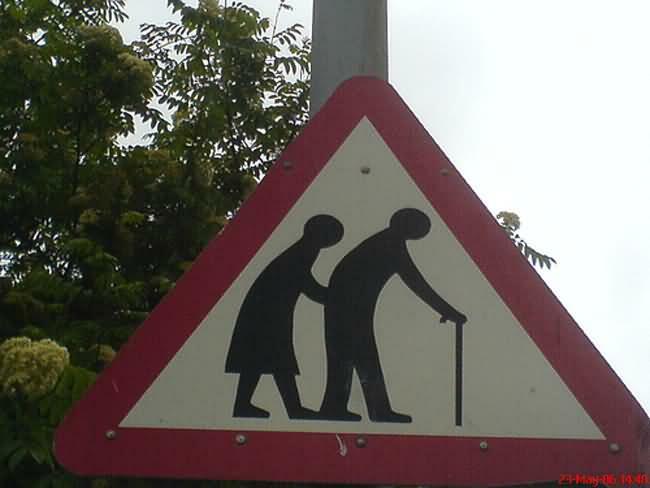 Road signs are meant to do anything from indicate an upcoming turn to warn of hazardous conditions but sometimes the signs are so unusual they�re more distracting than they are helpful. For those who spend a lot of times on the road here is a selection of road signs that can make you share a smile or get you in a serious rage. 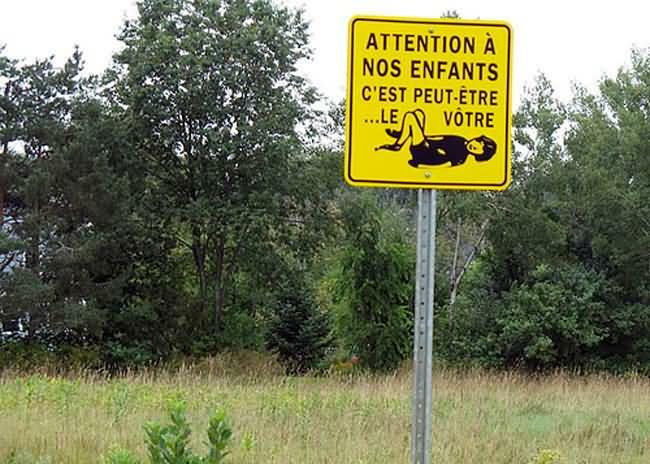 Rural Quebec is a strange land, with strange road signs. Take for example this one, which exhorts drivers in French to �watch out for our children, because it could be one of yours�. �It� being presumably, the child that you run over with your car. Which begs the question, why on Earth does the sign depict a child in the ideal position in which to become the victim of vehicular manslaughter? Other than China, Scandinavia takes the proverbial cake when it comes to signs that imply possible retardation. 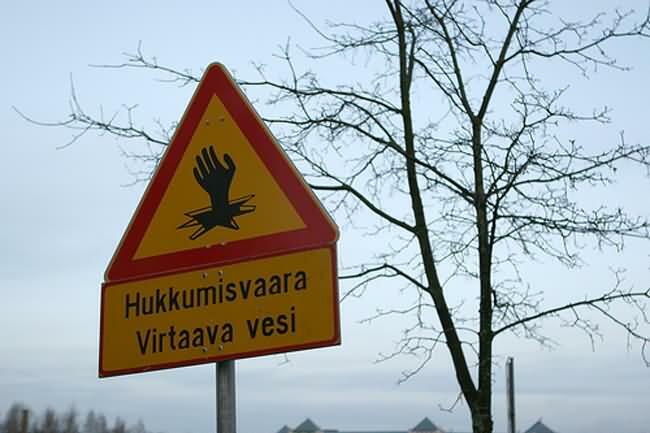 In this case, either Finland is under attack from undead cannibals or this particular town has a problem with thin ice. We doubt very much that it could be the latter, otherwise town officials would not have made a sign that could so easily draw comparisons to zombies. This is a situation where the sign is the punchline. Where to begin? First of all, do Swedish men carry purses or is that trend a Stockholm phenomenon? 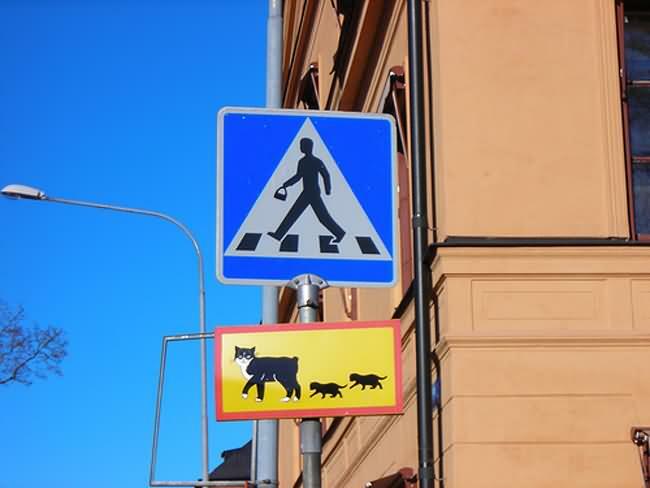 Second, how to interpret the cat sign? There is no crosswalk under paw, so does that give motorists free reign to have at them, pedal to the medal and let the fur fly? And why no tail on the mother cat? Creative Scandinavian license? A serious lack of creativity must be to blame for this street name in the state of Virginia. 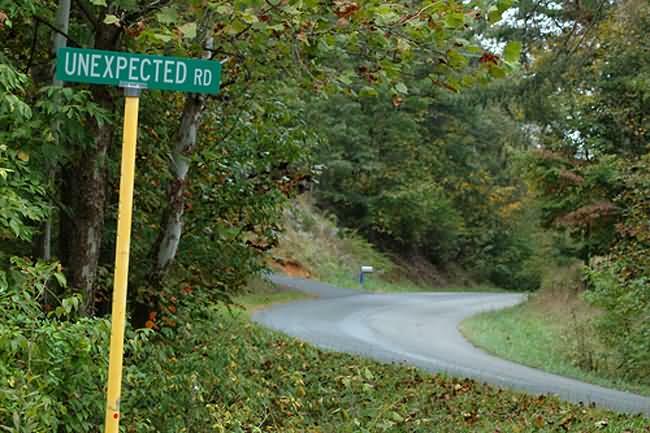 Unexpected Road? How in God�s name do you include that in any sane set of directions? 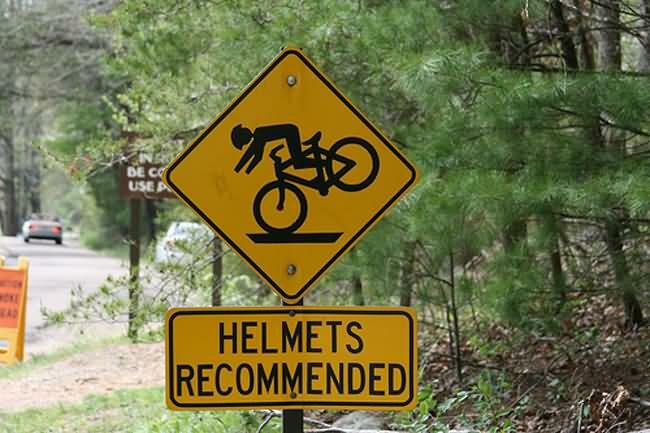 Maybe it�s just us, but from the looks of the perilous angle depicted in this sign, a helmet isn�t going to do you much good if you take a tumble on this Great Smoky road. Especially if you lack hands and fingers, let alone opposable thumbs. 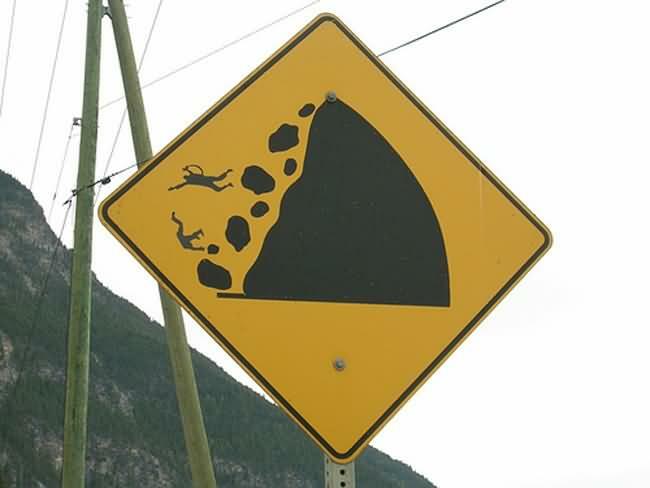 It�s not unwise to warn people about the dangers of slippery cliffs but still, there�s a certain slapstick Keystone Cops hilarity in this sign in British Columbia. 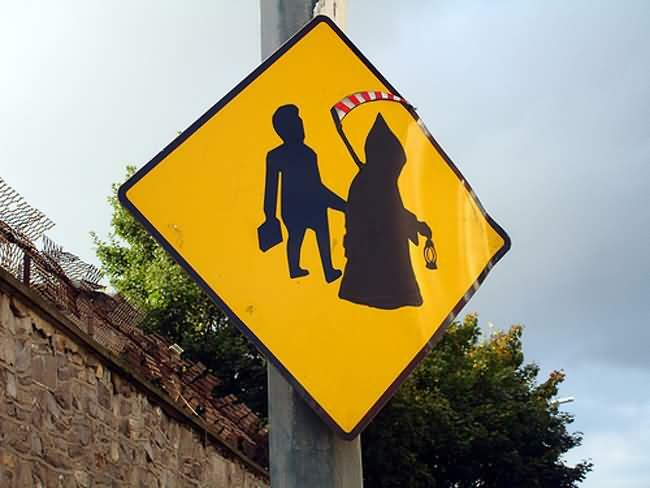 Are we to infer from this sign that a blind boy with a mild form of gigantism or elephantitis and a hand welded to a lunchbox has none other than the Grim Reaper as a personal crossing guard? Because if so, we may never visit Ireland again. At the very least not any neighbourhoods with a school zone. Chalk this one under �lawsuit filed, judgement rendered in favour of the plaintiff, sign erected�. How else to explain this overcautious caveat? 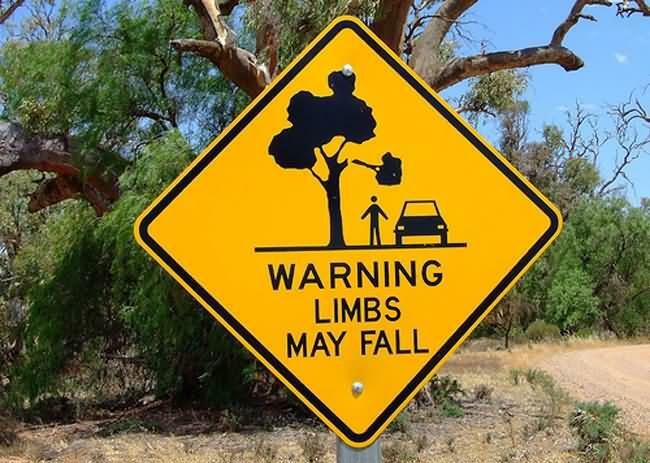 Does this not apply to all trees? Last we checked, tree branches are susceptible to break and fall from time to time. It�s called lightning and gravity. Look into it. Besides, what kind of tool would pull over to the side of the road, disembark from his motor vehicle and stand under a large tree with creaky limbs? What is the purpose of this sign really? Do we need a sign to graphically illustrate just how much damage a moose can do to a car? Are people so dense that they would slam their vehicle into an animal that large? You never see moose roadkill in Canada. Raccoons, skunks and squirrels, sure, but never moose. Beavers on occasion, although Canadians face long prison terms if caught with one in the grill of their vehicle. 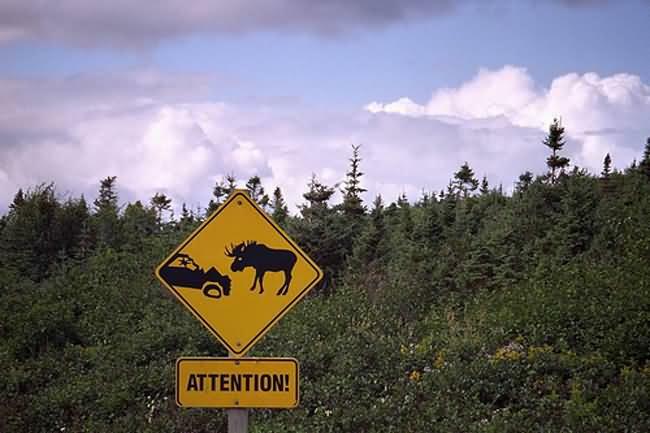 The moose though, generally survive the collision. Not as well as the bull in the sign mind you. Either that is one exceptional moose or that vehicle is a Smart car. The West Coast of the United States and Canada is different from everywhere else. What we know for sure is that residents like to hug trees, eat a lot of granola, listen to The Grateful Dead and for some odd reason, wear socks with sandals. This scares us. 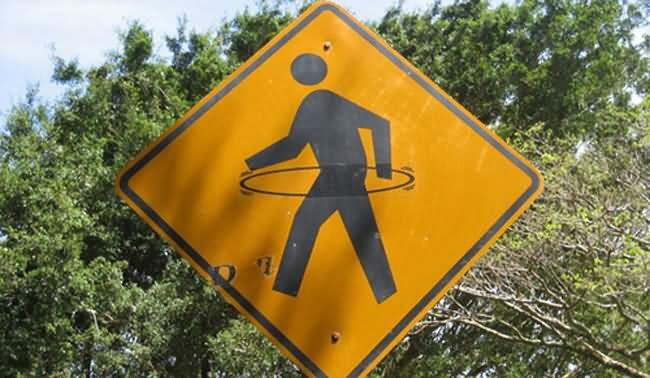 What correlation this all has with a Hula Hoop crosswalk sign in Washington State we have yet to discover. The fact that we have not seen anyone with a Hula Hoop since 1956 is even more cause for concern.